Shopping is an exhilarating experience, and for many, it is a way to de-stress. And what could be more exciting than shopping from home, and products delivered conveniently at your doorstep. Many of us like the "shop-till-you-drop" experience, and unsurprisingly, e-commerce is thus catching up and is one of the most lucrative businesses today. But the secret of a successful e-commerce business lies not in attractive human faces but an attractive and user-friendly website. If you are planning to start an e-commerce business, the stepping stone would be your website and that's where we chip in. Design club india has mastered the art of E-Commerce portal development and is providing top class, comprehensive, and end-to-end turn key solutions for highly interactive and user-friendly E-Commerce websites suited as per the business goal of each client and industry. Our designs are highly creative with supreme focus on user engagement and user experience to make each user feel like he owns the space and can keep shopping forever. "Designing Websites in Sync with Your Vision" Our strength lies in the expertise of our team and the ability to understand the requirement of each business and customize every aspect of our services to suit your needs. Our motto is the "You" approach and our thrust is to make sure that your website is in total sync with your business objectives. "Opening up to Greener Pastures" If you are looking for expert Open cart development services for your business, Design club india is the name to call out for. Our work involves thorough research and in-depth understanding of the client's business requirements to present you a website replete with high end features specific to your business. "Cart Full of Happiness for Your Customers" Shopping should be fun and hence we bring to you a user-friendly and no-frills shopping website based on Zen-cart platform. Zen cart is an open source online shopping cart system that can support a multitude of features, languages and currencies. Our Zen cart services range from installation, customization, up gradation, design, and services as per the clients requirements. "Top Notch Technology for Top-Notch Businesses" If you be on top of the game in the E-commerce industry, you need to choose an Online-shop that is flexible yet top-notch, which not only leads to inflated sales figures but also satisfied and happy customers. Magento is the benchmark in Online-Shopping websites which is sophisticated and functional. "Where Technology Meets Creativity" We at Design club india not only develop new sites but also upgrade existing sites, revamp and facelift the dull looking sites. 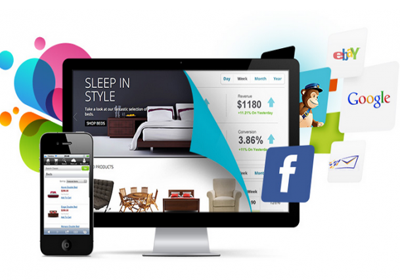 We understand that your websites need to stand out from the horde of online-shopping sites. Our OScommerce based platforms sprout not just from technical expertise but also from the creative acumen of our team.